VIRUN® and the Specialty Products Division at Hormel Foods were granted Patent number 8,741,373, Composition for Non-Polar Compounds. This particular patent allows unwavering high oil load encapsulation of non-polar compounds, such as Omega-3 EPA and DHA, CoQ10, Vitamins A, D, E, K, Carotenoids such as Lutein, Beta Carotene or Astaxanthin into certain water soluble and stable foods and beverages. Walnut, CA, July 09, 2014 --(PR.com)-- VIRUN and the Specialty Products Division at Hormel Foods announce the granting of patent number 8,741,373 after only three years. This patent marks VIRUN’s first joint patent-grant since the company’s inception and accentuates the growing trend toward smaller research and development cooperation with large, professional corporate organizations, such as Specialty Products at Hormel Foods. These types of joint ventures lead to avant-garde thinking and accelerated new product categories that inevitably stimulate and satisfy consumer demand. Together, Specialty Products Division at Hormel Foods and VIRUN have developed dozens of finished product applications utilizing this particular patent combined with Omega-3 EPA and DHA, such as single serving smoothie ready-to-drink beverages, baked good products, tomato sauces, dips, orange juices and low fat dairy products. These products do not just include Omega-3 EPA and DHA, but go above-and-beyond the usual doses of EPA and DHA typically found in a food or beverage. One notable application developed using patent number 8,741,373, is a 600mg EPA and DHA 8oz smoothie with 10 grams of protein that is stable under ambient conditions for up to a year unopened. 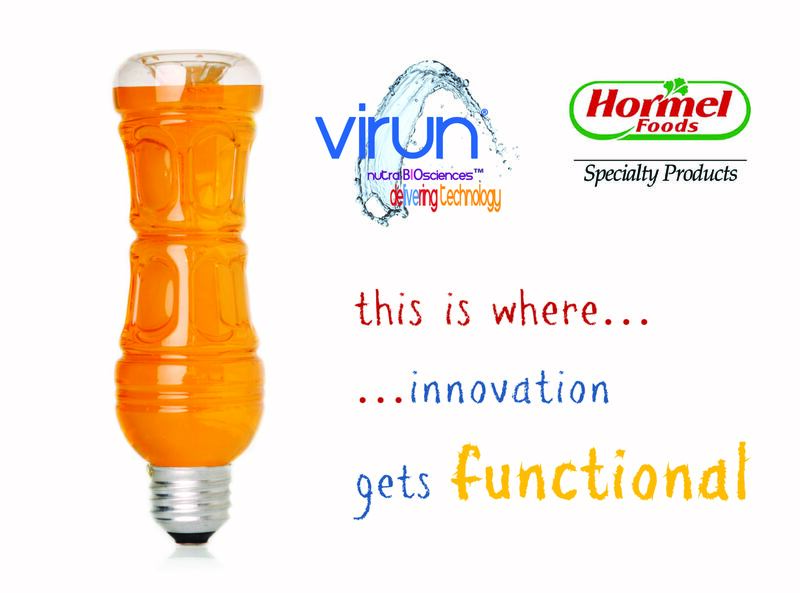 No matter what food, beverage or supplement application, Specialty products Division at Hormel Foods and VIRUN deliver innovation that exceeds expectation with their patented technology. Joint Innovation – Where has it Gone? Great ideas are the lynchpin of great inventions. As individuals, our ideas can often be limited by the extent of our own experiences and understanding. However, as a collective group, where more than one individual contributes to the idea, the corroborative effort spans further than what we may have invented ourselves. Specialty Products Division at Hormel Foods and VIRUN demonstrate this concept; that collective thinking and joint innovation can be used to create great products which draw upon the strengths of the collaborating entities. 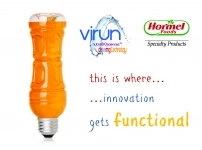 The Specialty Products Division at Hormel Foods can allocate its extensive knowledge of successful brand-inclusion and product development while VIRUN contributes its unique Nutra-BIOsciences delivery technology platform; the ultimate creation is an infusion of patented ingredients for foods, supplements and beverages, such as the FUXIONS™ brand of ingredients offered by Hormel Foods. Chet Rao, strategy and business development manager at Specialty Products Division at Hormel Foods and co-inventor of patent number 8,741,373 stated, “We collaborated with Philip Bromley, CEO of Virun four years ago and this application being granted shows that joint innovation between two companies can be successful. New food, beverage and supplement applications can be difficult to develop, and the resources required to achieve the desired specification can also be expensive and time consuming. Specialty Products Division at Hormel Foods takes the burden away from having to develop the application internally. Contact Specialty Products Division at Hormel Foods today and make an impossible concept a reality. We are a Nutra-BioSciences™ company formed in 2003, headquartered in Walnut, CA, with an emphasis on safe and effective delivery technology for pharmaceuticals, dietary supplements, foods and beverages. Our aim is to focus on delivery to the human body, via improving the efficacy of nutrients utilizing our patent and patents pending technologies. In addition to over 40 patents and patents-pending, VIRUN recently received a joint patent with Specialty Products Division at Hormel Foods that combine fully integrated research and production facilities with manufacturing in CA and finished product processing in FL. Hormel Foods Corporation, based in Austin, Minn., is a multinational manufacturer and marketer of consumer-branded food and meat products, many of which are among the best known and trusted in the food industry. The company leverages its extensive expertise, innovation and high competencies in pork and turkey processing and marketing to bring branded, value-added products to the global marketplace. The company is a member of the Standard & Poor's (S&P) 500 Index, S&P Dividend Aristocrats for 2013, was named the 2013 Sustainable Supply Chain of the Year by Refrigerated & Frozen Foods magazine, and was again named one of “The 100 Best Corporate Citizens” by Corporate Responsibility Magazine for the sixth year in a row. Hormel Foods was recognized on the G.I. Jobs magazine list of America’s Top 100 Military Friendly Employers in 2012 and 2013, and named one of the 2014 40 Best Companies for Leaders by Chief Executive magazine. The company enjoys a strong reputation among consumers, retail grocers, foodservice and industrial customers for products highly regarded for quality, taste, nutrition, convenience and value.